James slid the M50 smoothly around the spinning mass of rock, the controls of the Origin racer responding crisply. Jerking her into a roll, he punched the Peregrine through an opening in the next asteroid. Open space! He’d made it. Perhaps some introductions are in order. James is 13. His father’s ship is the Peregrine… a beautiful, sleek M50. His father is a courier and uses it to move small packages quickly. James had been badgering his father for months to let him fly it… just once. “I’ve flown 15,000 missions in Arena Commander Dad! I can do it! I know the controls, I know how the ship feels. Let me try… please.” James begged. “You’re 13 years old, James. No matter the amount of experience you might have in a simulation… nothing can prepare you for the very real dangers of flying. Ask me again in a few years… and keep practicing in Arena Commander.” His father tried to let him down as lightly as he could. James was not mollified. Stomping away in anger to his room, throwing himself onto his bed. He cursed his father. James knew he was a better pilot than his dad. He’d outflown him in Arena Commander hundreds of times. And then he hatched an idea. It took a few weeks but finally James was able to find the proper moment. His father was off-world after being contracted to help with an information run aboard a Herald and his mother was out for the evening, attending a holoconcert with her friends. James was tall for his age, so he was able to scramble into one of his father’s old flight suits – helmet and all. He tries to calm his nerves as he descends the stairs to the family’s private hangar. Excitedly, he climbs into the cockpit of the M50 and then forces himself to remember everything he had learned in AC. After carefully running through the pre-flight check, the moment came and he engages the engines, feeling the deep rumble as the blisteringly fast interceptor comes to life. Slowly and gingerly he exits the hangar, being almost too light on the stick. At that point, EDL assist takes over and he cruises smoothly over the vista of the city. Peregrine is released just short of the outer atmosphere. Taking control, he guides the tiny ship into the darkness. For just a moment he allowed himself to gaze back down at the beauty of his home planet. Somehow this is so much better, more beautiful, more visceral than the near-perfect simulation he is used to. James now focused on his next task – navigating a dense asteroid belt that lay between his home and the outer planets. James was in open space, having successfully dodged his way through the roiling, tumbling masses of rock. He just sat for a moment, watching the millions of stars adorning the view outside the cockpit glass. Then the scanners on the M50 lit up. Alarms went off. James peered down at the radar and saw that off to his port the scanners had picked something up… or… no. The radar was… full of ships. He spun the nimble craft to see what was bearing down on him and his heart nearly stopped. Lumbering towards him was a Kingship. James could just barely make out the hundreds of Scythes and Glaives swarming around the monstrosity. Fear froze him for a few moments… but adrenaline finally hit full force and his hands went to work on the Peregrine’s controls. Darting back into the asteroid field as fast as he could, he quickly glanced down at his radar and came to the horrifying realization that a half dozen Glaives were following him. James was terrified but also confident. 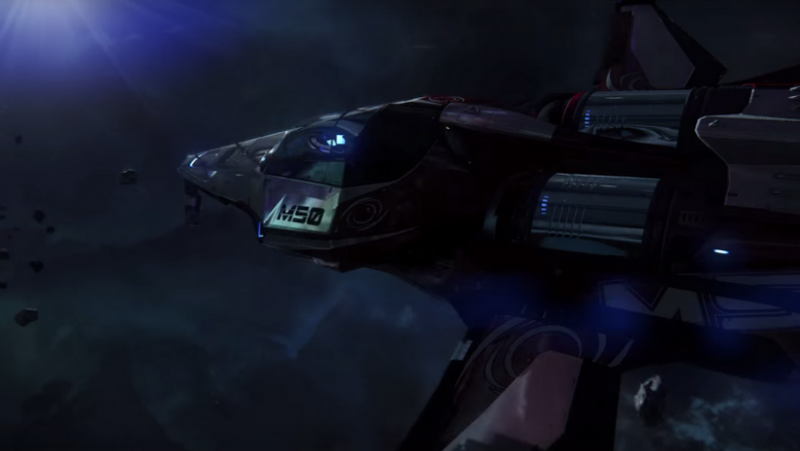 The M50 was faster than any Vanduul ship. Then the asteroid field paid him back for his earlier insolence. He came around a few smaller hunks of rock and noticed not far ahead there was a space between two gigantic asteroids. He pushed the M50’s thrust as much as he could, but the space was closing fast. Just as he was about to reach the crevasse, the asteroids slammed together with a spray of debris. James decoupled, spinning his ship rapidly and hammering the boost… bringing the speedy little craft to a dead stop. All six Glaives were coming right at him, only 900 meters away. How did they get so close?! He had no time to think as the M50 screamed missile lock warnings at him. Popping chaff twice, he spun back towards the giant rocks. Pushing the M50 back to maximum speed, flying only a few meters over the asteroid’s surface, dodging and weaving in and out of craters. Feeling like he was doing very well. James felt a sharp jolt and the Peregrine began spinning out of control. A quick look at the damage readout told him that a few shots from the closest Vanduul had ripped off his port wing, also causing him to lose most of his thrusters. Main engines were damaged but operational. James’ heart was racing faster than he thought possible. Tears poured down his face as he wrestled with the hobbled craft, struggling to keep her under control. Finally he managed to bring her to a full stop, but the Glaives were approaching quickly. His death seemed only moments away. James just sat, feeling like he was going to sob. There was no sense in running… he couldn’t get away. Not anymore. Just as he expected the final volley from the alien ships, a torrent of bright red laser bolts washed over the Vanduul ships. The Glaives attempted to turn to fire on their new foes but one by one they exploded violently, their debris drifting off in all directions. The most welcome sight James remember in his young life met his eyes, a wing of Super Hornets. Their UEE Navy livery etched into his memory for the rest of his life. The entire HUD suddenly went offline and he realized that one of the hits on Peregrine must have damaged the power generator. One of the Navy pilots flew right up to him, giving him a thumbs up. James smiled a watery smile, tears of relief now rolling down his cheeks, and returned the pilot’s gesture. James switched on his mobiGlas transmitter and sent a short range message to the pilot, letting him know he needed help. Systems offline. The pilot looked at his own, visibly military-style, mobiGlas screen. A return message sent to James said that they would have an Argo out to get him as soon as possible. The wing of Super Hornets flew off and James waited… and waited. Thankfully he had enough oxygen for a dozen hours if needed. It was only about three until the Argo showed up. The pilot of the Search and Rescue ship encouraged James to EVA into the rescue pod. Using the manual release for the cockpit glass, he pushed the pane away and used his suit thrusters to move the short distance into the Argo. The doors shut, a few nurses rushing in to check him out… he wasn’t injured. “Can I talk to the pilot?” James asked one of the nurses. They allowed him to use the intercom. James thanked the pilot repeatedly before sinking to the floor of the rescue pod in relief. He could hardly believe such nice people existed. Once on board the Minotaur, an Idris Frigate, James gazed in wonder out the window. The space around the ship was… a mess. Debris from hundreds of ships, mostly Vanduul, floating in a thick and roiling cloud. The front ram from the Kingship cruised by and slammed into an asteroid as he watched, sending hunks of rock floating in all directions. Way off in the distance James saw an incredible sight. A Retribution Super Dreadnought, the rarest and most legendary of UEE Navy ships. James now knew exactly what had dealt with the Kingship. James was delivered, as promised, back to his home by a UEE Navy Reliant. His mother cried and held him. James cried too. He was beyond relieved to be home. Unfortunately his mother’s tears were not only of relief. The Drake Herald his father was aboard was confirmed destroyed in the massive Vanduul incursion. James spent years recovering from his loss and helping his mother do the same. At 18 James joined the UEE Navy. He trained to be a fighter pilot, his first fighter was a trusty Gladius and he gradually worked his way up the ranks. At the end of his military career he was considered one of the most lethal Lightning pilots in the fleet. Months after he returned home to his thrilled and relieved mother, James descended the stairs to the hangar in his flight suit. He stood for what seemed like an hour, gazing across the Self-Land at the tarp-covered shape in the corner. He approached with reverence and hesitation. Slowly he pulled the covering off of the ship and took in the sight of the Peregrine. The UEE Pilot who saved him all those years ago was as good as his word, the Peregrine had been fully repaired. But never flown. To this point neither James nor his mother could ever bring themselves to get back in the cockpit. James slowly ran his hands along the smooth panels of the sleek ship, a few tears rolling across his cheeks unbidden. ‘The Peregrine needs to fly.’ The thought echoed in his head until he finally succumbed. He reached out and tapped a button on his mobiGlas – the cockpit glass of the M50 opening, the ladder descending. James climbed into cockpit seat and sat for quite some time, running his hands along all of the controls. James finally freed the Peregrine from her cage and a short time later, while in orbit around his world, he felt right again. At peace. For the first time since he was last at the controls of the tiny interceptor. The rest of James’ life he followed in his father’s footsteps. He created a thriving courier business with the trusty Peregrine M50. He piloted her continuously until his death at the age of 129. The Peregrine, the longest serving M50 Interceptor, was retired to the Origin Jumpworks museum in the city of New Austin on Terra. James never beat his father’s time on Old Vanderval. Thank you for reading! If you have any feedback, please leave a comment down below!